At the risk of turning into 'that odd girl who likes to take pictures of fish tins', indulge me. I found a cracker in Waitrose this week. And the funny thing is, the moment I saw it, I knew exactly which blogger's pantry I would expect to find these Pilchards in. So let's have some fun! Leave me a comment on this post, guessing who came to mind and I'll put all the correct answers in a hat and send a little prize to the winner. Edited: And everyone has to promise not to take offence. Because there is no shame in buying pretty food. But given it's sealed. No, not me. Oh blimey, what a risk; if I guess and get it wrong, will the person I nominate be insulted that I think they would take pictures of pilchards? Oh well, here goes nothing. I guess Alice might fill her cupboards with beautifully decorated tins. Though now I think of it, other people are coming to mind ... Argh, I'll quit while I'm ahead! I say that because a tin like that would attract her more than the contents! Thanks for visiting my blog and leaving a nice comment. It is much appreciated. Lovely tin but as for guessing who might have one....not a clue! It's not me is it? I wish I knew who go guess but I don't....Like the funny tin though..
Ha - I spotted that too when looking for anchovies! But, I, refrained from buying it! Dare I say Alice too?! I think it's Mrs. Brocket, too. I immediately thought of Alicia of Posie Gets Cozy fame when you said pretty food, but maybe I'm totally off track? Excuse me, now I'm off to check up what a Pilchard is. Must be Cornish? The tin is to remember the Newlyn fleet who used to catch them before they were fished out. i love this...such great packaging!! Someone must have be doing some subliminal sardine campaign. No, there is no shame in buying pretty food at all. Trust me, if I could afford it, I would buy food in pretty containers and for there pictures and labels all the time, seriously. Very curious who you have in mind. First I had to look up Pilchards. Now that I know they are sardines - I bought two cans this morning. I have NEVER purchased sardines before. I agree with Alix - there is something subliminally sardine-y going on. Sadly, neither of my purchases has the charm of yours. Next, what does "I found a cracker in Waitrose this week" mean? I haven't a clue. Third, because I only know one or two people that you might know, I'll guess Alice C at The Magpie Files. Or maybe Blackbird at Say La Vee. Oh definitely Mrs Yarnstorm, she would love it so. it must be elsie marley. or not. Could it be Yarnstorm? I imagine that her pantry is full of pretty tins and this would certainly fit the bill! Ha! If you turn it over and the sell-by date is C20 then it is mine. But if it surrounded by other tins in carefully chosen shades of red it is La Brocket's. My own guess is Cherry Menlove at Pixie Wood. well I immediately thought of Vintage Pleasure? Gorgeous tin, what a fab find! I'm going to have to go with Alicia, Posie Gets Cozy, I'm sure I remember a post of her's discussing her purchase of items just for their containers! Failing that, it's something I do too! Somehow I feel that this tin would be so at home in Jane at Yarnstorm's pantry. I never eat fish myself but have to say that is one very attractive tin - trust Waitrose to stock something so upmarket. I've no idea but I'm sure Nigella must have a tin or two of those! beats me! NO clues here. I wish I liked eating tinned fish. 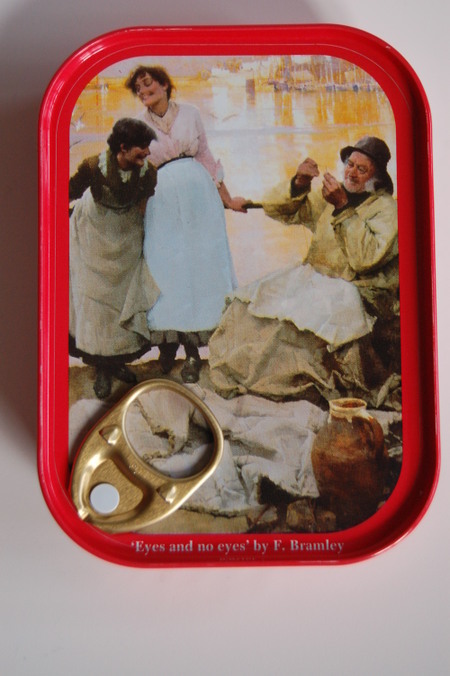 I might occasionally eat smoked sardines on a dry biscuit, but the rest.... Do you keep these tins for storage of little things once you have finished eating the contents? How are you liking your new bloggy digs so far? I would hazard a guess at Jane Brockett, over at Yarnstorm. Great find too! I do not know enough other bloggers to even have a guess but it is a fab tin.